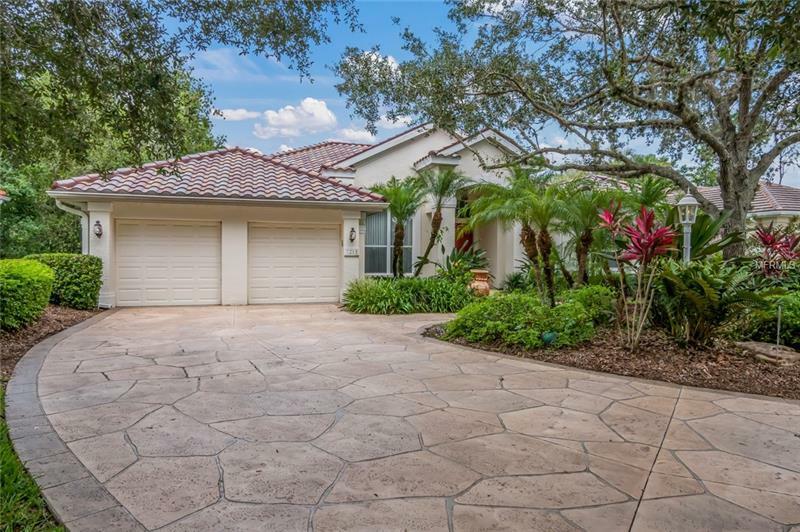 This lovely updated home is located in the Highgate community of the sought after University Park Country Club. There's an abundance of natural light throughout and beautiful tropical views of the lush landscape surrounding the home. This custom Anchor built pool home features 3 bedrooms, 3 baths plus DEN, crown molding, new wood bamboo flooring in the living room and dining room. The kitchen and baths were updated in 2012 with granite and cherry wood cabinetry, stainless steel appliances, Samsung refrigerator, Bosch dishwasher, island, tile backsplash and counter lights under the 44 cabinets. Other features include a large office/den with desk and built-ins. The master suite boasts bamboo flooring in the bedroom, his and hers walk-in closets, granite and cherry cabinetry, huge linen closet, dual sinks, soaking tub and walk-in shower. The oversized 2-car garage has a side golf cart entry. Relax and enjoy the private screened lanai w/solar heated pool & spa. NEW $35K ROOF, A/C-2013, new pool motor, rescreened lanai, laundry room updated 3 years ago, 2-3 yr old water heater. The 2-car garage features a 9 ft. cabinet for all your storage needs. University Park is an active social and golfing community with 27-holes of championship golf, fitness, tennis and many social groups and activities. Located near upscale shopping, restaurants and all other social and recreational venues that Sarasota has to offer. Welcome to your HOME IN PARADISE! !